The Laura Ingalls Wilder Park & Museum in Burr Oak has acquired a new property. 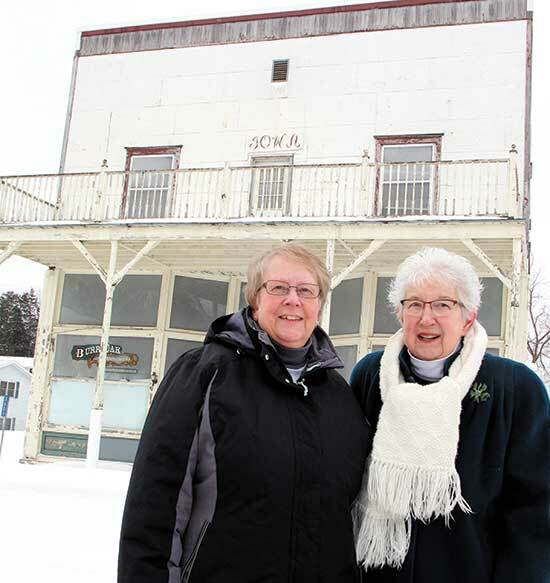 In December of 2018, the former “Burr Oak Mercantile” building was gifted to the museum by the family of the late Robert M. Brimacomb. Brimacomb’s wife, Ferneva Brimacomb, was executive director of the Museum for eight years. Both she and Bob were active supporters of the Museum for several years and consider the Museum an important asset to the community. “The board and staff are excited at the potential this building brings the Museum and are eager to start fundraising to begin the restoration process,” said Laura Ingalls Wilder Board President Dawn Maroushek. Although the former mercantile was built in 1908, years after the Ingalls family lived in Burr Oak (1876-1877), the building gives the Museum an opportunity to expand. Offices and the Museum’s gift shop are currently housed in the old Burr Oak Savings Bank, which has limited space. The goal is to restore the Mercantile building for the Museum’s gift shop and offices, and use the bank building as a Burr Oak History Center. With the acquisition of the Mercantile, the Museum now owns four properties in Burr Oak consisting of the Master’s Hotel (the childhood home of Laura Ingalls Wilder in 1876), the former Burr Oak Savings Bank and the Advent Christian Church (located at the gates of the Burr Oak Cemetery). Both the Master’s Hotel and the former Burr Oak Savings Bank are on the National Register of Historic Places. The Laura Ingalls Wilder Museum welcomes, on average, 6,000 guests (May-October) from all 50 states and many different countries, having a significant impact on tourism for Winneshiek County, according to Maroushek. The Museum’s goal in restoration is to have a portion of the building set up as an old mercantile, representing the era when it was built. “This will give visitors a chance to visualize the early 1900s in addition to their Museum tour, which gives them the opportunity to experience what life was like for Laura in Burr Oak during the late 1800s,” Maroushek said. The Museum is a non-profit organization with limited funds and the board hopes the community, citizens of Winneshiek County and Museum guests will help in funding the Mercantile restoration. There are several ways to help. Direct donations to the Museum can be designated for this project. Donations can be made to the Museum’s annual campaign or supporters can become a member of the Museum. The Museum also holds annual fund-raising events -- a spaghetti supper/auction and the Laura Days celebration. All donations to the Museum are tax deductible. They can be mailed to Laura Ingalls Wilder Park & Museum, 3603 236th Ave., Burr Oak, IA 52101. For more information on the Laura Ingalls Wilder Park & Museum, visit lauraingallswilder.us. The Museum’s Spaghetti Supper is Friday. Feb. 22, 5:30-7:30 p.m. in the basement of St. Benedict Church, 307 W. Main St., Decorah. The meal includes spaghetti (meatless is available), garlic toast, salad, beverages, ice cream and toppings. The cost for adults is $10, children 5-12, $5, and children 4 and under are free. Carryouts are available. Raffle prizes are a $100 Walmart gift card, a $100 Fareway gift card and a $100 prepaid Visa card.